Call it possibly the biggest “oops” in bureaucratic history, but some Indiana lawmen are apparently concerned that going to so-called “constitutional carry” without a license or permit in that state will cost their agencies “tens of thousands of dollars,” according to the Terre Haute Tribune-Star. They are probably mistaken, but it’s an interesting concern. Revenue from those license fees go into a fund that is used to purchase firearms, ammunition and training, according to Vigo County Sheriff Greg Ewing, commenting on House Bill 1159. This revelation raises at least a couple of questions. Since when did the exercise of a civil right become a cash cow for local agencies? Why should law-abiding armed citizens be expected to foot the bill for law enforcement training and equipment? More than a dozen states now have “constitutional carry” laws, eliminating the requirement for a license or permit when carrying a defensive sidearm. These gun law reforms don’t actually eliminate the permit, which is still worth having for travel to other states with reciprocal agreements that honor one another’s carry licenses/permits. It is not clear if such laws have actually reduced the number of licenses issued. One example might be educational. In Arizona, which adopted permit-less carry some time ago, the number of licenses has steadily crept upward. As of Sept. 10, the number was at 320,973. That’s up from 318,988 on July 30. Back on May 1, Arizona had 314,040 active carry licenses. It doesn’t appear the bureaucracy has lost a dime. According to the Tribune-Star, the Vigo County Sheriff’s Department “has collected $21,200 in local handgun license fees. A four-year license brings in $10 locally, while a lifetime license amounts to $50 for the sheriff’s department. A little basic math could provide an estimate of just how much money is being discussed. 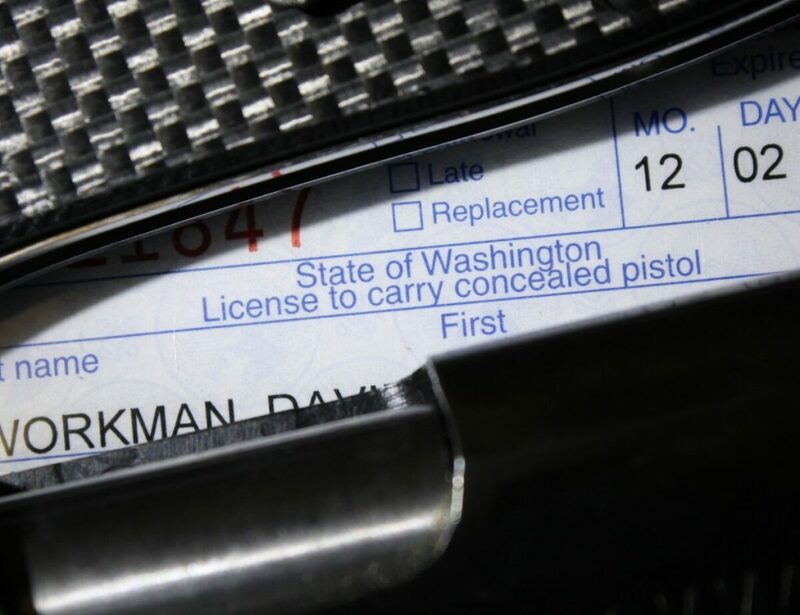 In Washington State, for example, where first-time concealed pistol licenses run $36 with an additional fingerprint fee for the FBI and renewals cost $32. There are approximately 590,000 active CPLs in the Evergreen State, renewed every five years. That’s big bucks. Congress is currently considering national reciprocity legislation, which the gun prohibition lobby is frantically opposing. Ironically, anti-gunners contended for years that gun owners should be licensed just like drivers. The down side of this is national reciprocity, because driver’s licenses are recognized in all 50 states, so it would only make sense that a carry license/permit would be afforded the same consideration. Driving is a privilege, bearing arms is a right protected by the constitution. Some anti-gun state and local governments charge an exorbitant fee for a carry permit (New York and Washington, D.C., for example) in an effort to discourage people from applying. Other places use the revenue to offset costs that should be borne by all taxpayers. And a handful have adopted “constitutional carry” laws that restore the Second Amendment as the only “permit” somebody needs.